I was very excited to hear that I will be going to the London Olympics next year. Recently my friend Ross jokingly commented that I should be able to qualify for the olympics because I had accidentally uploaded GPS data from a cycling trip with tags indicating that it was a run. However, this is not the reason I am going to the Olympics - the real reason is because I was lucky enough to be allocated tickets for Hockey and Canoe sprint heats in the recent lottery based application procedure. I have been allocated 6 tickets so I will be bringing my parents as well as my wife and two daughters. It should truly be the experience of a lifetime and none of us are likely to get to the olympics ever again (unless the girls have sporting skills that they have not yet revealled). My daughters are actively involved in both sports so I know that they will like to see top class athletes competing in sports that they understand. Many people who did not get the tickets that they were seeking, have been critical of the lottery process. I know my opinion is coloured by the fact that it worked out for me, but I think that the allocation process is as fair as it could be. Whenever the demand outstrips the supply by such a huge amount, it is inevitable that people will be disappointed. The one thing that I thought was unfair, was the fact that tickets could only be purchased with a Visa credit card, but I can't say I am surprised because they are a major sponsor. The way that the process works is that you needed to supply details of all of the events that you would like to go to by a dealiner in May. This is a tricky process because you need to have enough money/credit available to buy all of the tickets you have applied for eventhough it was obvious that applicants were unlikely to get most of the tickets that they applied for. I chose to apply for a large selection of low profile events rather than going for some of the high profile events which I thought would be way oversubscribed. Since these events were cheaper, I was able to afford to apply for a wider range. It seems that this was a sensible choice because I applied for just short of 2,000 pounds worth of tickets and was allocated over 200 pounds worth which seems to be higher than the normal "rate of return". I have not yet made any travel or accomodation arrangements. I know demand will be very high during the busy Olympic period, but I have more than a year to sort this out surely it will be possible too arrange something. P.S. What is really cool is the fact that I was able to write up this blog post while on a plane thanks to the cool tablet PC I got for father's day. Last Sunday was father's day in Ireland. The ladies in my life know that I always love getting a new gadget and so they decided to club together to by me a tablet PC. 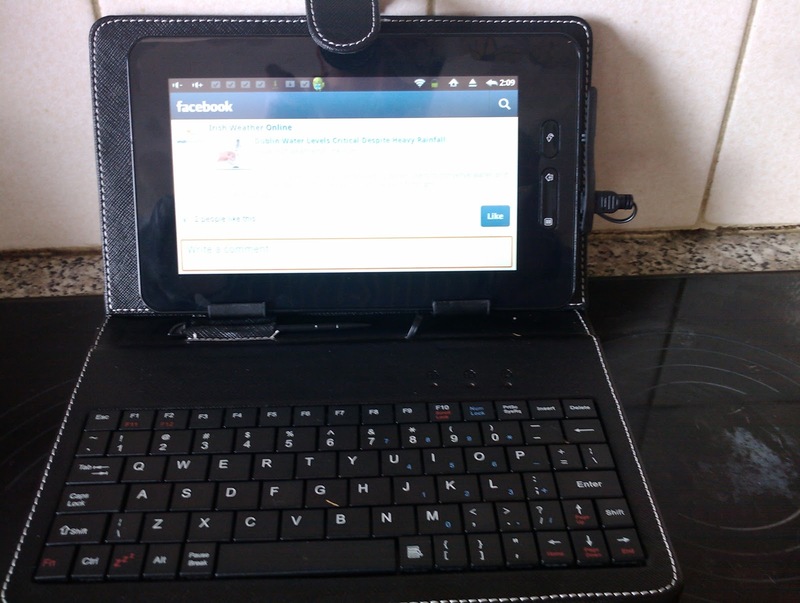 I had been considering purchasing a tablet PC for some time but I was put off by the high prices and also since I have both a Laptop and a SmartPhone, I was not really convinced that I need a device that fitted in between. They must have spent a lot of time researching the purchase because, they really made an excellent choice. The model they bought be was a miScroll. which is an Android 2.3 based tablet so I was able to leverage my experience of using an Android phone to know which applications to install. Although the keyboard is quite small, I have not had nay problems when typing long documents with it. I have even started use Lotus Traveler on this device because it is much easier to type a complex password on this keyboard and hence my earlier objections to using it on my phone won't apply. It always takes a little while to determine if a new computer is something that I will really use. I have only been using this device for a few days so far, but I am convinced that this will be a long term love affair rather than a brief fling. Is it possible for someone in their 50s to remain cool? When I was in college (many years ago), I was in a rock band called UllSkull with my brother and a few other friends. When I tell my kids about this, they look very skeptical and doubt if I am telling them the truth. Any band formed these days would probably have lots of videos on YouTube and elsewhere to prove that the band really did exist. Unfortunately recording equipment was not as readily available back then and so there is no record of what we sounded like. I think a few photographs might have been taken, but although we thought we looked really cool back in the 70s, we would probably look ridiculous to the modern generation so I am not going to search too hard for them. I grew up and matured so my music career is only a distant memory, but my brother is determined to remain young at hard and so he joined with a few friends to form a new band recently. His new band is called Diamonds in the Rough and here is a video of them in action. They actually sound not unlike what I remember of UllSkull (not sure which band members will be more insulted by that comparison) but thankfully they don't look at all similar. Our team for the Cycling Challenge is called "re-cycling crew"
IBM and a number of other companies have teamed up with the Smarter Travel site, to organize a 10 minute cycle challenge which will be held from the 1st to 22nd of June. This is a fun event aimed at encouraging people to cycle more. Teams are awarded points for every time one of the team members goes on a cycle that lasts 10 minutes or more. There are bonus points for journeys that are to and from work and novice cyclists (i.e. people who haven't cycled in the last 6 months before the challenge) get bonus points. As I normally cycle to and from work, I think this is a great idea. I have recruited 5 colleagues (including one novice cyclist) to join me in a team which we have chosen to call th ere-cycling crew. I am sure you will wish me luck, although this is clearly an event where the taking part is more important that the winning. Hopefully there won't be too much rain during the month. You will be able to follow how we are doing on the leaderboard which will be updated weekly.